OLD TAPPAN, N.J. -- Last Wednesday, 10th-graders at Northern Valley Regional High School at Old Tappan got a up-close view of driving under the influence, with some high-tech goggles. The students got to experience a DUI simulation with the help of "Fatal Vision" goggles, designed to create the effect of driving under the influence of substances, and golf carts. They drove through a course, experiencing the balance, vision and reaction-time issues impairment can create. "The DUI simulation program is part of Northern Valley Regional High School at Old Tappan's commitment to educate students on the dangers and ramifications of substance use," said Principal Bruce Sabatini. The program was coordinated by the Old Tappan, Norwood, Northvale and Harrington Park police departments, with the assistance of NVOT Driver Education teachers. 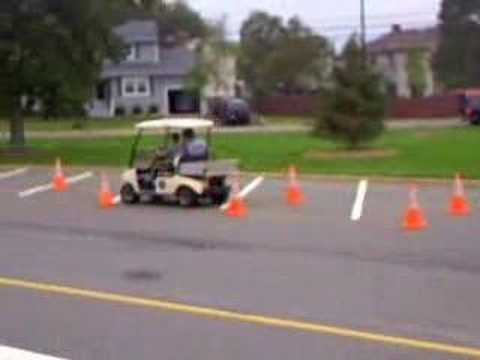 The Old Tappan Country Club provided the golf carts. For more information about the goggles, click here.